My American family has fallen in love with Europe’s Center Parcs. In fact, if we let our three young boys plan every vacation, I’m pretty sure they would choose to visit nothing but Center Parcs for the rest of our time overseas. And why not? As far as I can tell, they’re the best thing ever for a family looking to play together throughout Germany, France, Netherlands and Belgium. 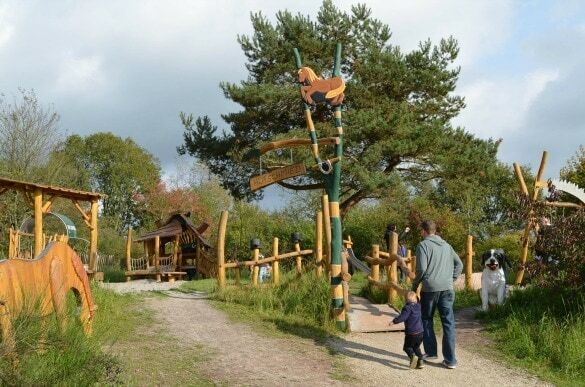 We had such a wonderful experience in France at the Center Parcs Trois Forêts last spring that when I asked my twins what they wanted to do to celebrate their third birthday, they requested another Center Parcs vacation. 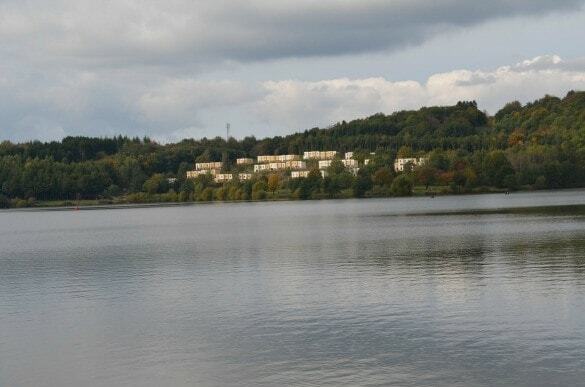 Fortunately for us the new Center Parcs Park Bostalsee is just a few hours away in Saarland, Germany. Every Center Parcs is built around a different concept. Here, the park is focused on the natural beauty of the lake on which it resides, Lake Bostalsee. The cottages are square units in rows together overlooking the shore. Vacationers can enjoy every lake recreation activity you can imagine with many boats to sail, paddle and float. The beach is small but private and the property is surrounded by woods. During a family bike ride along the approximately 7-kilometer bike path that encircles Center Parcs Park Bostalee, we encountered the most delightful German biergarten. Lucky for us, they were celebrating Oktoberfest that weekend, so we joined the festivities for a memorable birthday lunch. A ride around the bike path is a must! Not far from the beach lies the ‘market’ area which houses the supermarket, restaurants, mini golf, arcade, bowling alley and the pool area. With only a long weekend to visit, my family had to quickly cram every activity we could. Biking around the lake was a must, as was a game of bowling and some jumping on the super cool trampoline. It looked like so much fun I even had to give it a try. 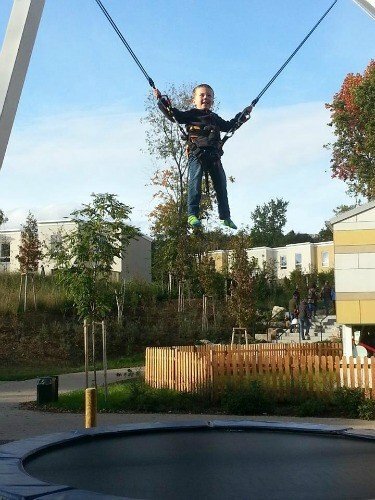 My 4-year-old’s face says it all – the trampoline was a huge hit at Center Parcs Park Bostalsee! For sports lovers, there’s a large, fenced-in field for playing soccer. Families can also register to experience numerous outdoor activities. 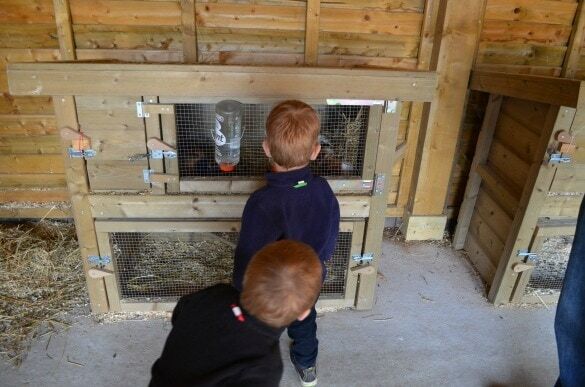 My children especially liked the farm animal petting area and adjacent outdoor playground. Aqua Mundo at Park Bostalsee is an indoor wonderland of pools and fountains. The little kids’ pool boasts a ton of cool water features, a mini slide and a huge sandbox INSIDE the pool. Brilliant! Another pool area offers older children waterslides and other fun sprinklers beside a giant wave pool. 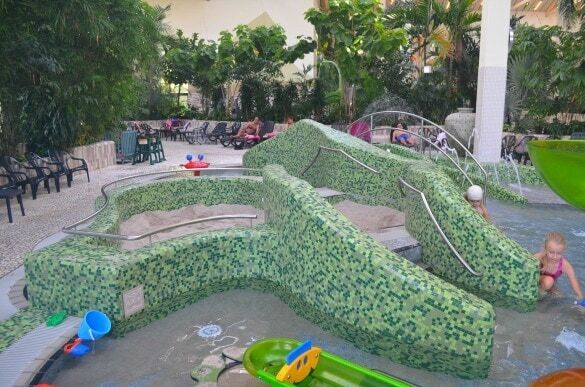 A huge double whirlpool spa and three fantastic waterslides complete the water play area. Don’t forget the outside pool either; our boys loved swimming outside in the chilly fall air. The earlier you book a Center Parcs stay, the bigger the discount you will receive. Prepare for your Center Parcs vacation online before leaving home. This includes check-in, arranging activities, making dining reservations, and reserving linens if your cottage doesn’t come with them. Reserve (or bring) bicycles! If your cottage is located far from the market area, you will want to walk or bike to Center Parc’s offerings. Pack your own beach towels and pool toys. The locker room is extremely clean but they don’t have many family-sized changing rooms. Locker rental is €1, but you get your coin back when you’re finished. Bring your own groceries. There is a supermarket in the main market area, but it’s rather expensive and you never know if they’re going to be out of something. We didn’t get a chance to enjoy our in-cottage fireplace because the firewood was sold out the entire weekend. Center Parcs are a special treat for people in Europe to enjoy. I can imagine that families and friends come year after year to make memories and spend time together. We are so grateful to have experienced them too. 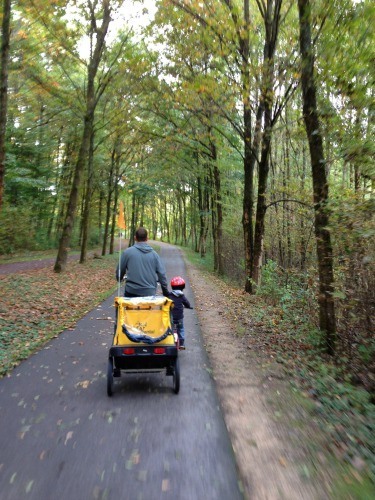 Do you think a Center Parcs vacation would suit your family? Why or why not? Let us know in the comments below! A Note from The Nomadic Travel Mama: Thank you to the wonderful people at Center Parcs for the complimentary cottage upgrade, bike rentals and a birthday decor package surprise upon arrival. All thoughts, opinions and words are my own.